Many, maybe most, people visiting a capital campaign site are already interested in giving… but they need to know the campaign priorities. And if they find one that’s convincing, the need a clear, quick path to make a donation. From this point, people can either click directly on a top of highest interest to see more content (including a short student, faculty, or staff quote) and a “Support Academic Strength” or similarly labeled pathway to the related donation page. That design of course makes it quite easy to measure interest in the campaign topics as time unfolds by tracking how many people are following each of the 5 topics… and the size per donor of the gifts that might result. The site earned a “Fair” rating from Google Test My site: a 7 second mobile download speed. Google projects a 26 percent visitor loss rate. 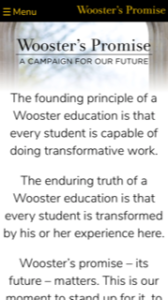 Review a strong presentation of capital campaign goals and giving pathways for the Wooster’s Promise campaign. Join 577 people on the Top Tasks: Higher Education Website Content group on LinkedIn. Request membership here.